I recently returned from a vacation in Dubai, a place that offered guaranteed sunshine, warm seas and experience of a different culture. In this post, where to find summery tall linen clothes will be explained - to get straight to business, click the 'Read more' link below. Meanwhile, more about my holiday . . .
Dubai is a city founded on buying and selling, and faced with blazing sunshine and temperatures that exceed 100'F even in spring, locals (and tourists) escape the heat in vast air-conditioned malls to spend time on the national hobby - shopping! The newest and grandest of these shopping malls lies in the shadows of the world's tallest building, the Burj al Khalifa, a fitting place for a tall man to start his shopping! With more shopping area per person than any other location in the world it's hard to avoid the shops, but if you need a break from browsing, the malls have a variety of other activities like a ski slope with real snow (Mall of the Emirates), an aquarium and ice rink (Dubai Mall), a recreated Egyptian temple (Wafi Mall) as well as Persian, Moroccan and Chinese architecture (Ibn Battuta Mall) or even a Venetian-themed mall (Mercato) or an underwater mall (Atlantis). Just like the architectural styles and the tourists, the malls also bring in shops from all around the world, with stores from the US, Europe and Asia all in one place. Only the very top end brands and jewellery are significantly cheaper than you will find at home, but the whole experience is quite something! It's the not the place to shop if you're a tall man (or woman!) but to get a head-start on summer clothing, I did manage to find some nice linen trousers and shirts. Linen is one of those perfect summer fabrics, as it's cool as well as looking relaxed and stylish (if the Egyptian pharoahs were buried in it, surely it's good enough for us). If you do happen to be looking for tall clothes in Dubai, see the bottom of this article for some ideas. Below are some ideas for linen clothes a tall man can find closer to home right now. 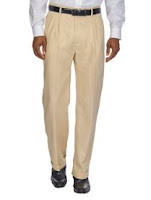 Men's Wearhouse, the men's value/discount retailer, currently have some linen trousers with an unfinished 38 inch inseam, including those pictured above from Calvin Klein (up to a 54 inch waist). I find their shops a little chaotic but if you have the patience to pick through, there are some occasional good quality tall man bargains, and these are an example. If you want the longest hem possible, order the pants unhemmed and go to a local tailor to get them finished. That way you may be able to get around 37 inches length whereas if you ask for this to be done when you order, they will typically use a lot of material for the hem and you will only get 35 - 36 inches of inseam. At the very casual end of the spectrum, Tommy Bahamaoffer some extra long linen pants for more informal wear. Paul Fredrick also have some styles with unfinished hems including some that are currently reduced (May 2016). Otherwise, Charles Tyrwhitt offer impeccably tailored classic linen shirts in plain or patterned styles, with short or long sleeves. Click on any of the pictures below and type 'linen' in the search box. If you're not inspired by this selection, try Paul Fredrick. This major US catalog and online retailer has a wide selection in their Big & Tall section. They have an extensive range of pure linen and linen/silk trousers and sports shirts, including slim fit shirts (great for tall slim men). They are also the only people I have seen with checked and striped linen trousers up to 36 inch inseam (not my style, but don't let me stop you). 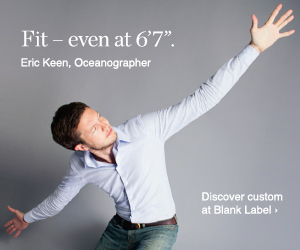 Some sizes look more suited to big and tall rather than tall slim men, so check carefully. In case of problems they do offer free returns. Update: right now (end of August 2010) some of these styles are substantially reduced. Shorts for tall men can be easier or harder to find, depending on how particular you are about length. I'm happy as long as they come within an inch or so of my knee, and I don't much like shorts that stop half way down my shins. Shorts generally will have an inseam anywhere from 9 inches to 12 inches. If, like me you're 6'5" (195cm) or taller you should definitely aim for an inseam of 11 or 12 inches. Zappos has a couple of nice examples with a 12 inch inseam as well as other styles that are not so long. Charles Tyrwhitt are headquartered in the UK based and will deliver worldwide. Paul Fredrick will also deliver to most countries. The other suppliers above will not. In the UK, TM Lewin and John Lewis have a reasonable selection of linen shirts, and they normally size quite generously, but you will need to check. In Dubai itself, I did not find any dedicated stores for big and tall men. However, in the Dubai Mall I did find stores, including Sacoor Brothers, that offered tall and large sizes of shirts as well as unhemmed trousers - I bought a pair of linen trousers on sale, and they had hemmed them within an hour - at 8pm in the evening! Seeing my height, the tailor absolutely minimised the hem - at less than half an inch this was the absolute longest inseam he could possibly make. I also bought a great pair of linen cargo shorts in a branch of Celio, a French chain that has stores in various countries worldwide. Another interesting fashion tip to note in Dubai is that you will see a lot of stores with familiar names from Europe - Pierre Cardin, Azzaro, Ted Lapidus, Guy Laroche - that all sell very similar clothes and they do not have a very high quality feel. But these are not actually fakes. The reason? They are all owned by the Paris Group, who basically pay to use the name of European labels and manufacture their own clothes. Look carefully to make sure you are happy with what you buy as quite a lot of chains in Dubai sell completely different clothes to the same chains in the US or Europe, despite having the same name! I noticed the same thing with some ladies stores, including Victoria's Secret. Article updated in May 2016 based on updated availability from the retailers mentioned here. Looking for 34x36 tall men's pants specifically?